In the heart of the village of Megève, this new luxury chalet is a real jewel. Its architecture and decoration are innovative and offer a unique resort. This luxurious chalet is the perfect example of a new architectural style, with neat finishes, new materials mixed with state-of-the-art equipment. The chalet Velours is located in the heart of the village of Megève : close to shops, the departure of the Chamois cable car, transport... This prestigious chalet consists of a beautiful living room comprising a double living room with a central fireplace, a dining area and a kitchen with a wine cellar. This chalet has 6 double bedrooms and 1 bedroom with two single beds. The following services complete this luxurious chalet : Sauna, Hammam, indoor swimming pool with lounge, massage room, outdoor Jacuzzi and a sports room. An elevator gives access to the 5 levels of the chalet. A garage + an outside parking space + a garden. 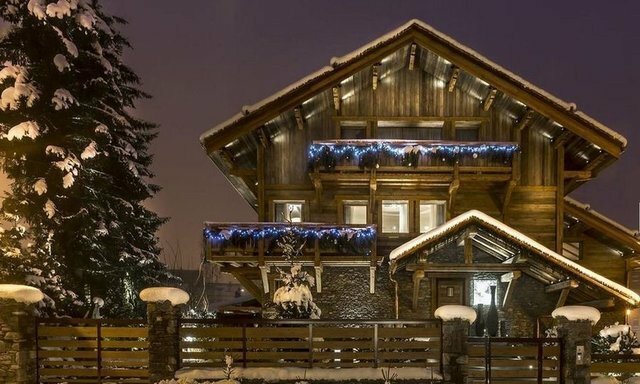 The key points of this luxury chalet: - Located in the centre of the resort - New chalet decorated with quality materials - Relaxation area - Large reception capacity Propriétés de Megève Sotheby's International Realty, experts in selling of luxury chalets in Megève.